Maharaj jee says, O human being Waheguru jee man eishaa dhaan karanan: dhaan karanan means to give us the gifts, karanan means to do, to give, dhaan means gifts; Maharaj jee gives us those gifts, which gifts? - man eishaa - all of those things that we desire in our mind, the various desires which we have in our man, which we have in our mind God gives us all of these. Sathiguru Maharaj jee is talking about the bounty of Akaal Purakhjee, how Maharaj jee, how Waheguru jee, how Lord God gives us everything. Sarabathr aasaa pooraneh - sarabathr means all, aasaa means all, all of our hopes pooraneh - are fulfilled. Waheguru jee is the One who fulfills all of our hopes. 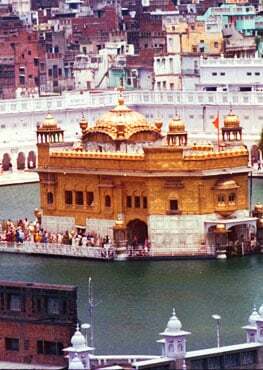 Waheguru jee is the One who blesses us with our mind's desires, our mind's hopes and our aspirations, He fulfills them. Another interpretation of this line is: man eishaa dhaan karanan - O human being in your mind have the eishaa, have the shubh eishaa - the pure hope to have union, to be united with God, have that eishaa - have that hope in your mind and dhaan karanan - Waheguru jee will give you the dhaan - the gift of brahamgiaan - of complete knowledge of Lord God Waheguru. When you get this giaan then sarabathr aasaa pooraneh - all of your hopes, all of your aspirations will be fulfilled, if you get that dhaan - that gift of brahamgiaan - that gift of complete knowledge of the Lord. Waheguru jee is the One who can khanddanan - who destroys kal - all of the kalapana - means when we are crying out for things, kalaeseh - arguments and pains. Maharaj jee says that if you meditate upon Akaal Purakh then Waheguru jee destroys all of your kalapana - all of your crying out and all of your kalaesheh - the many arguments, the many conflicts within your life will be resolved: internal and external conflicts; internally with desires and externally with others if prabh simar - if you meditate upon Waheguru. Sathiguru Arjan Devjee says Naanak neh dhooraneh - Waheguru jee is not far from you, Waheguru jee is with you at all times. Dhoor means to be far away, neh means not: Waheguru jee is not far away. Jis - with the sang - the company of whom habh rang - habh means all, rang means pleasures, maanehi means to receive, you receive and you enjoy all pleasures because you have that light of Akaal Purakh within you, because you have that jot within you. when that light leaves your body then nobody is going to sit with you, then you are going to be taken to a crematorium and buried - whatever it is. That Waheguru who enables you to enjoy all of these pleasures of the world thai sio laaeeai naehu - attach your naehu - your consciousness, your focus to Him. So sahu - that Waheguru, bindh n visaro - even for one moment, bindh means moment, a calculation of time; even for a moment bindh n visaro - may I not forget Waheguru. Naanak jin sundhar rachiaa dhaehu - rachiaa means to create and dhaehu means body: who has created this beautiful body, who has given us our hands, our eyes and all of these senses, who has given us all of our qualities. Sathiguru Maharaj jee says that look at all of these gifts that Maharaj jee has given us and remember them. Sometime sit down and look at your hands, without your hands what would you have done, without your eyes, without your ears, look at everything that God has given you and thank Him! Do not go into ego because without His grace we would have nothing. Waheguru jee gave us the jeeo - the soul that is within us, the praan - our breaths, than - the physical and spiritual body within, dhan - all of the wealth: everything that we think we have gathered together that is a gift from Akaal Purakh. If Waheguru jee wouldn't have given us this body then who could we have gathered together wealth? - dheeaa - Gurujee gave us all this. Dheenae ras bhog - Wahegurujee is the One who gave us all ras - all essences to taste, all flavors to taste and bhog - all pleasures. Grih - these houses, these mansions, raths - these chariots that we drive around, these cars, as - the horses; Sathiguru jee Maharaj is talking about that time but we can apply it to this time: the cars, the trucks - whatever else it is that people drive dheeeae - Waheguru jee has given us these. Rach bhalae sanjog - Waheguru jee is the one who rach - who created bhalae - created good sanjogs - good relations with others, who created good destiny and through good destiny having good relation with others; with our family, with our friends, all of these relationships that we hold dear Waheguru jee has given us all of these. Suth - our sons, banithaa - our wife, saajan - our friends, saevak - our servants dheeeae - Waheguru jee has given us all of these. Prabh dhaevan jog - Waheguru je is the only One who can dheeeae - who can give. Guru Tegh Bahardur jee says, jagath bhikhaaree firath hai sabh ko dhaathaa raam - Waheguru jee is the giver to all, this whole jagath from the pauper to the prince everybody is asking for something. Waheguru is the Only One who dhaedhaa dhae laidhae thak paahi - He keeps giving, laidhae thak paahi - we get tired of receiving but He doesn't get tired of giving. By meditating upon Hari, upon Waheguru than man hariaa - your than - your body and your man - your mind are hariaa - they are both enraptured, they both blossom forth because anxiety leaves your mind therefore your body also glows with that happiness. When someone is happy how do you see them? - A smile comes upon their face, when someone is angry their forehead gathers together, their eyes go red. So emotions bear a relationship with our external features as well. Har simarath than man hariaa - by meditating upon Hari our than - our body and our man - our mind blossoms forth. Lehi jaahi vijog - lehi jaahi - with the grace of Waheguru, through their grace all of our vijog - all of our separation from Akaal Purakh is taken away and we are united with Waheguru. Maharaj jee giving us a command through this hukamnama today, in the saadhasang - in the company of the Holy - of the Guru centered beings, in the company of Siri Guru Granth Sahibjee Maharaj, in the company of the saadasang har gun ramahu - contemplate, meditate upon the virtues of Hari, of Waheguru binasae sabh rog - Maharaj jee says that binasae - meaning to be destroyed, sabh means all. Not one or two, not just spiritual or mental, Guru jee is saying spiritually, mentally, physically any rogs - any disease that inflict you can be taken away through meditation upon the Naam, meditation upon Waheguru. Waheguru Jee Ka Khalsa, Waheguru Jee Ki Fateh !